As part of larger efforts to promote low-altitude tourism, Sanya started to allow helicopters to fly in low-altitude airspace over Sanya Bay on a trial basis for the first time on March 22. The three helicopters were on display at Sanya Bay beach. 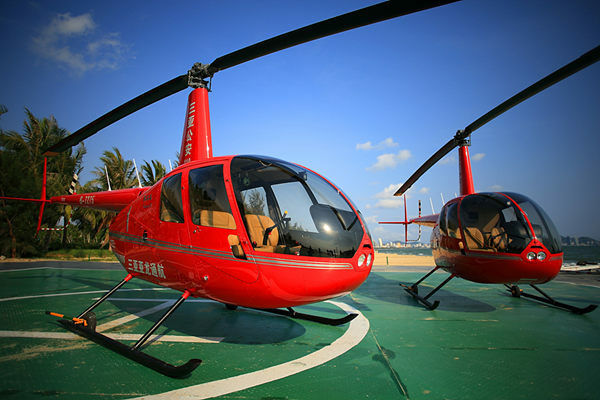 Residents and tourists who wanted to get a bird’s eye view of Sanya Bay and the surrounding scenery from a different angle could enjoy this kind of helicopter tour for free. According to Sanya authorities, low-altitude tours are expected to open soon and will operate in Sanya Bay, East Islet, Phoenix Island, Luhuitou, Wuzhizhou Island, Haitang Bay, Nanshan and other scenic spots to explore the beauty of Sanya in the future. The flight tours are designed to last between 10 minutes and 1 hour, with prices ranging from 1,700 yuan to 27,000 per person. There is also chapter flight on offer if customers request one, with prices set around 30,000 yuan per hour. The helicopters, which are operated by Hainan Sanya Yalong General Aviation Co, are the Robinson R44 light helicopter introduced from Robinson Helicopter Company after being authorized by the Civil Aviation Administration of China. The company will introduce a 206 American Bell helicopter and plans to have 10 helicopters in Hainan market by 2015.